My grandfather was one of the last doctors in Cincinnati, Ohio to make house calls. 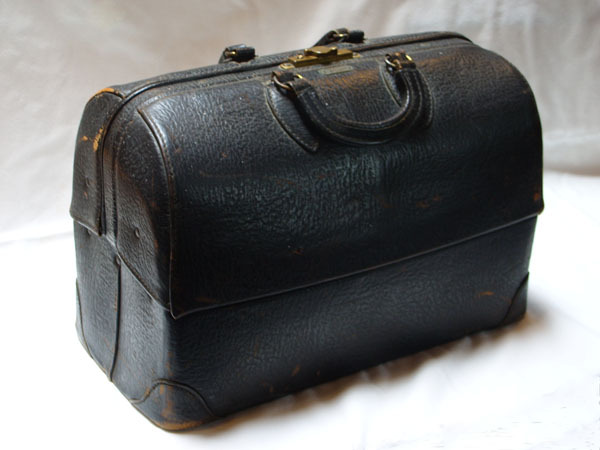 I can still remember walking through the front door of my grandparents’ condo and seeing his medical man-purse—the ubiquitous black leather doctor’s bag—laying on the front hall wicker chair I’m convinced no one ever sat in. I don’t know much of what lay in that bag besides the skeletal core of an MD’s toolbox, but since he graduated from medical school during the second World War I can’t imagine it was a repository of the latest and greatest in medical technology. Stethoscope…reflex hammer…tongue depressors…rubbing alcohol and cotton…flashlight…the usual. My grandpa most definitely would have a big vial of Mercurochrome, which was a personal favorite. Anyone under the age of 35 who didn’t have an elderly, injury prone doctor for a grandad probably has no idea what this stuff is, but it was a topical antiseptic for when someone got a boo-boo and wanted it to heal quickly without scaring. The stuff was effective and incredibly cheap, but it stained your skin this vibrant orange color and, as the name would suggest, it contained significant amounts of mercury. Clearly, my grandpa was on the back end of history and when he died a little more than a decade ago, that history went with him. A mighty fine manpurse for a doctor. I don’t think anyone would argue that brushing a child’s scrapes with a mercury-based compound is a better treatment option than modern antiseptics, nor do many people believe that advances in medical technology are a bad thing. The amount that we can do with science today is just staggering. At The University Of Maryland Medical Center, surgeons recently performed a face transplant. A face transplant?! I can’t even begin to imagine what that would entail. 150 years ago our idea of surgical precision was sawing cleanly through a man’s femur when he had a leg infection and now we’re giving people other people’s faces! It’s something that sounds straight out of the work of the recently late Ray Bradbury and not a viable medical procedure. And yet, does anyone really feel like our society is that much more well? Since 1955, the average life expectancy in the US has gone up about 9 years from 69 to 78.2. This may sound remarkable, but we need to look at this juxtaposed against global growth during the same time period. In 1955, the world life expectancy was only 48 years, compared to the robust 69 years enjoyed in the United States. Fast forward to today and our avg. life expectancy has grown by a scant 9 years, while the world’s has skyrocketed up to 19 to an average of 67 years. Put another way, the US was ranked 7th globally in life expectancy in the 1950s and today we rank 38th in the world behind such medical luminaries as Cuba and Costa Rica. How could this have happened? Well, now would be a great time to advocate for comprehensive, universal health care, but it’s been done so many times in so many ways by people eminently more qualified than I, that it might be prudent to take a different tact. You see, I’ve got a theory about at least part of the cause of of America’s health woes that leads back to the now antiquated house doctor. Apparently, as of 661,440 doctors in the United States. Do you know how many of them are primary care physicians? Only about 353,000. We’ve reached a point in America where the number of specialists almost outnumbers the number of general practitioners, threatening to create the biggest oxymoron in the history of medicine. The Association of American Medical Colleges has said that we could face a shortage of 150,000 doctors in 13 years and I don’t think they were talking about too few dermatologists or podiatrists. What happened to the doctor who actually knew his clients for years at a time? The doctor who treated grandfathers and fathers and sons from the same family and knew medical histories by experience and not computer reference? It’s simple. He or she got bought. A specialist, like a cardiologist or an oncologist, is likely to make twice as much a primary care physician. As a matter of fact, researchers at Duke University have calculated that a specialist will make about $2.5 million dollars more over the course of his or her career than a primary care physician. No wonder the family doctor is a dying breed. However, while part of the problem can be chalked up to the system, an equal part of the problem lies with the physicians themselves. I want you to take any doctor or med school friend of yours who has made the, I can’t afford to be a primary care doc argument, and whap them upside the head. Primary Care Physicians still make around $2.5 million dollars as a career average, which is more than business school grads ($1.7 mil) and dwarfs that of your average college grad (about $340k)1. And, while the average med school grad’s debt of $150k is insanely large, the 5-7 years it normally takes to pay off those loans is made back about sixteen-fold over the course of a career. The waiting room just got bigger. Look, if you’re going into a profession with the primary goal of making money, just don’t become a doctor. Get your MBA and become an investment banker or join an oil company lobby or something. There are plenty of ways to get rich without having to take the Hippocratic Oath. In that oath is the pledge to “remember that I do not treat a fever chart, a cancerous growth, but a sick human being, whose illness may affect the person’s family and economic stability.” To be a specialist is to make this pledge incredibly difficult. When your job is nothing but treating metastasized lung cancer, how can you not see people as organs instead of complete human beings. The specialist is the quintessence of Western medicine: I am here to fix you and to focus all my energies on this one area of the human body. Once you are fixed, our relationship is done. Not everyone can be a specialist nor should everyone be. The medical community must recognize this and adjust their career paths and pay grades accordingly. Specialists are responsible for some of the most amazing medical advances and techniques in the world. They should be lauded for their achievements and encouraged to continue seeking out ways to combat specific diseases and ailments to the best of their abilities. But they cannot be the norm. A doctor may not make house calls anymore, but that doesn’t mean that the core of the house call can be lost. The house call was community and it was connection. There is an intimacy in crossing the threshold of another person’s house just as there is in letting another person cross into yours. Ask anyone who has worked in outpatient mental health settings or child protective care…seeing where a person lives makes you feel as though you know them more fully, whether you wanted to or not. It is that understanding and that special bond that must find its way into modern medicine, by hook or by crook. Medical instruments should be sterile, but physician’s relationships with his or her patients must not be. We must call on the houses of others.